The SMO receptor mediates Hedgehog (Hh) signaling critical to development, differentiation, growth, and cell migration. In normal conditions, activation of the pathway is induced by binding of specific endogenous ligands (i.e., Sonic Hh) to its receptor Patched (Ptch), which in turns reverts the Ptch inhibitory effect on SMO. SMO activation ultimately determines specific target genes activation through a family of three transcription factors, Gli1, Gli2 and Gli3. Although Hh signaling is significantly curtailed in adults, it retains functional roles in stem cell maintenance, and aberrant Hh signaling has been described in a range of tumours. Mutational inactivation of the inhibitory pathway components results in a constitutive ligand-independent activation seen in tumours such as basal cell carcinoma (BCC) and medulloblastoma. Ligand-dependent activation is seen in tumours such as prostate cancer, pancreatic cancer, gastrointestinal malignancies, melanoma, gliomas, breast cancer, ovarian cancer, leukemia, and B-cell lymphomas. A significant body of evidence supports the conclusion that SMO receptor antagonism will block the downstream signaling events. As part of a program to address unmet medical need with regard to tumours in the CNS, Siena Biotech has designed and investigated selective antagonists of the SMO receptor. 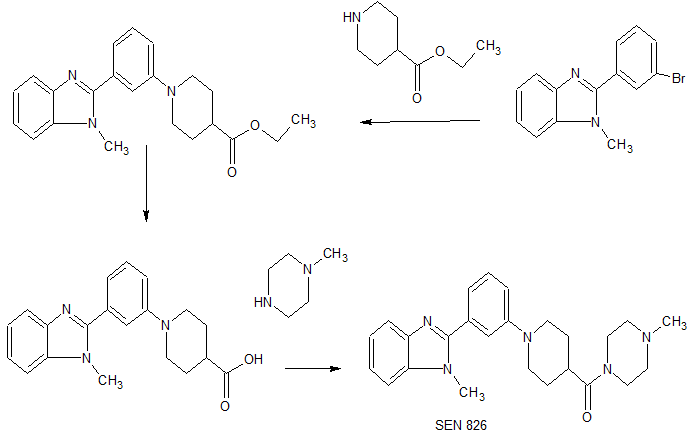 The newly designed API development candidate SEN826 1 is part of a group of potent antagonists of the Hedgehog pathway. The synthesis starts with the formation of the 2-arylbenzimidazole derivative 6 which can be carried out starting from N-methylphenylenediamine 2 (Method A; blue path in Scheme 1) or employing o-phenylenediamine 4 in the ring closure reaction followed by N-methylation (Method B; orange path in Scheme 1). Sodium hydrogen sulfite is used to promote the condensation of the corresponding o-phenylenediamine with the Br-aromatic aldehyde 3. (6b) The next step is the coupling of the aryl bromide with isonipecotic ethyl ester in Buchwald conditions. After acidic hydrolysis with HCl under microwave irradiation, the final amide 1 was synthesized with CDI as coupling agent. 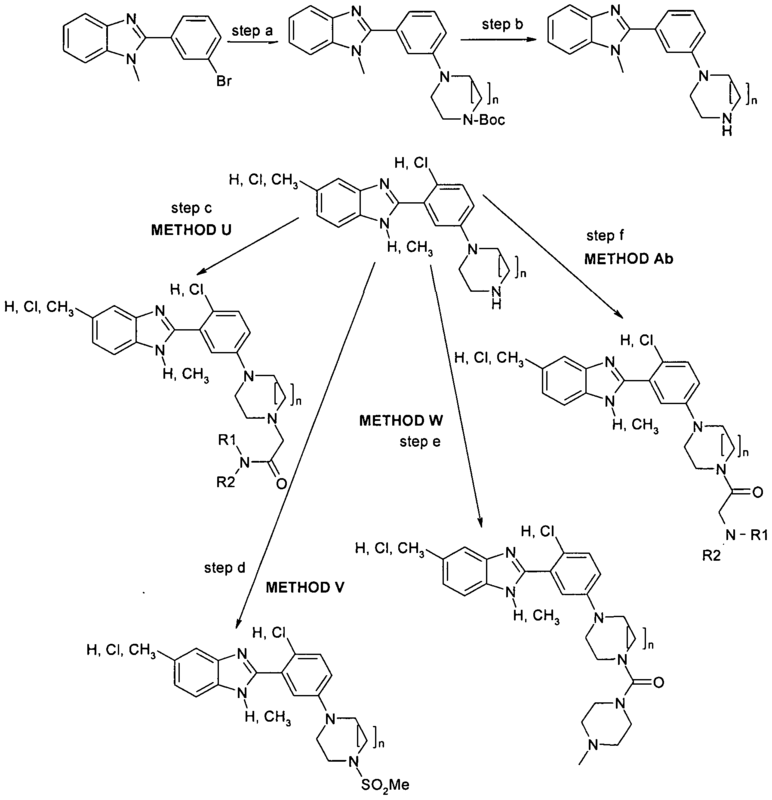 A practical and scalable route to the SMO antagonist SEN826 1 is described herein, including the discussion of an alternative approach to the synthesis of the target molecule. 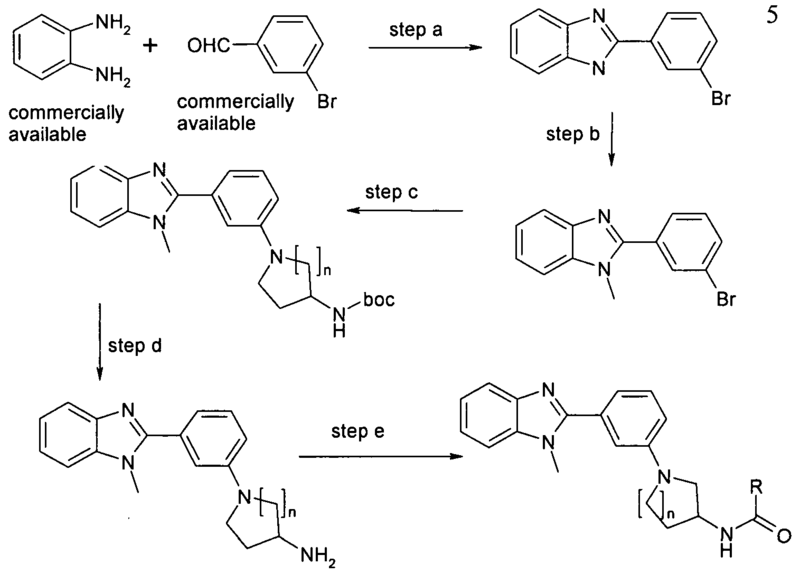 The optimized route consists of five chemical steps. 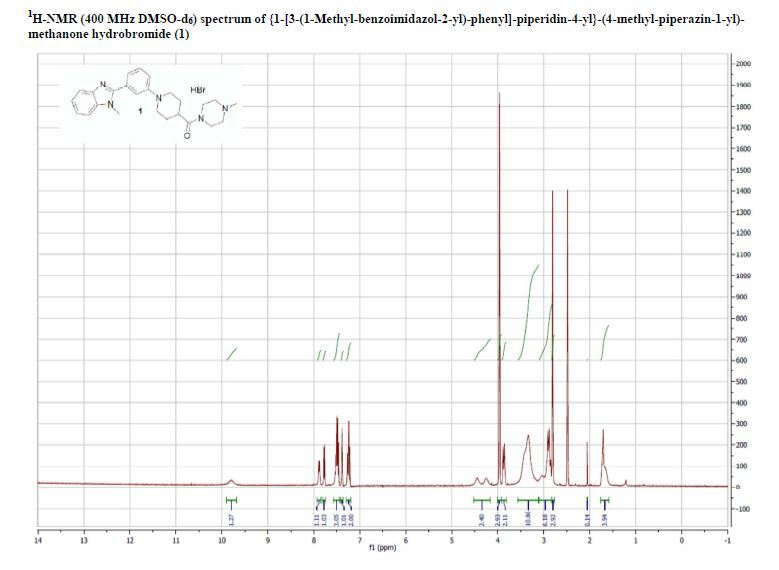 A new and efficient access to the key intermediate 6 via the bisulfite–aldehyde complex was developed, significantly enhancing the yields and reducing costs. 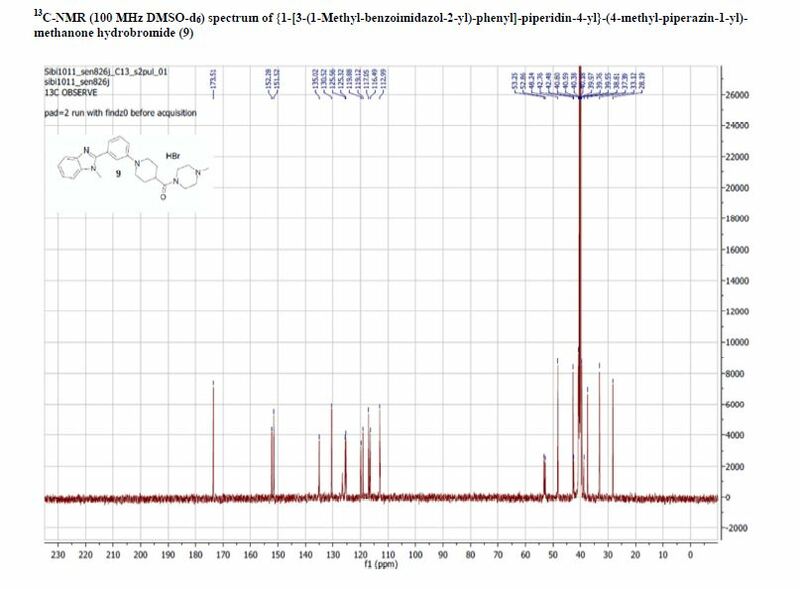 As a result, a synthetic procedure for preparation of multihundred gram quantities of the final product has been developed. 1 as hydrobromide salt. Yield: 71%. UPLC–MS: tR = 1.24 min; m/z = 418 [M + 1]+. HRMS calcd for C25H33N5O [M + 1]+ 418.26069, found 418.26075. HPLC: tR = 5.99 min; purity 99.1%. 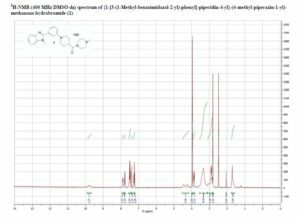 1H NMR (400 MHz DMSO-d6): δ 9.80 (broad, 1H), 7.89 (m, 1H), 7.77 (m, 1H), 7.55–7.45 (m, 3H), 7.38 (s, 1H), 7.24 (m, 2H), 4.48–4.15 (m, 2H), 3.96 (s, 3H), 3.86 (m, 2H), 3.55–3.15 (m, 3H), 3.10–2.82 (m, 6H), 2.81 (s, 3H), 1.76–1.57 (m, 4H). 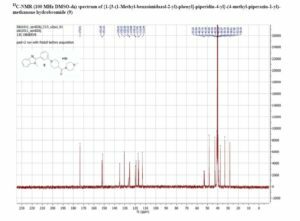 13C NMR (100 MHz DMSO-d6): δ 173.5, 152.3, 151.5, 135.1, 135.0, 130.5, 126.2, 125.6, 125.3, 119.9, 119.1, 117.1, 116.5, 113.0, 53.2, 48.2, 42.7, 38.8, 37.4, 33.1, 28.2. Water content (KF): 3.5 wt %. Pd content (ICP-MS): 128 ppm. Bromine content (ionic exchange LC): 20 wt % (1.2 equiv).